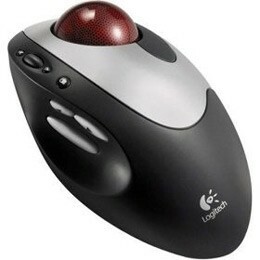 Our most advanced trackball yet. It's comfortable, cordless, finger-operated and works where you need it. Save space and eliminate desktop clutter. Our most advanced trackball yet: a comfortable, cordless, finger-operated trackball that works where you need it. Save space and eliminate desktop clutter. Take advantage of extra buttons that help you navigate around Windows and the web more easily. And with Logitech's patented optical technology, you get virtually maintenance-free precision and smooth tracking.